Just off of Georgian Bay, on the stunning Bruce Peninsula, is the small, quaint community of Wiarton. This small town in Ontario is known for its breathtaking landscapes and views of the water and cliffside. The entire area is very scenic and secluded from big cities, with many private areas along the water which are ideal spots to host a lovely ceremony. Using a loved one’s home to host a wedding is always very sentimental and meaningful to both the couple and their family. Since Bruce Peninsula is known for being a great cottage country, this family cottage was a perfect location for this bride and groom to say their vows. 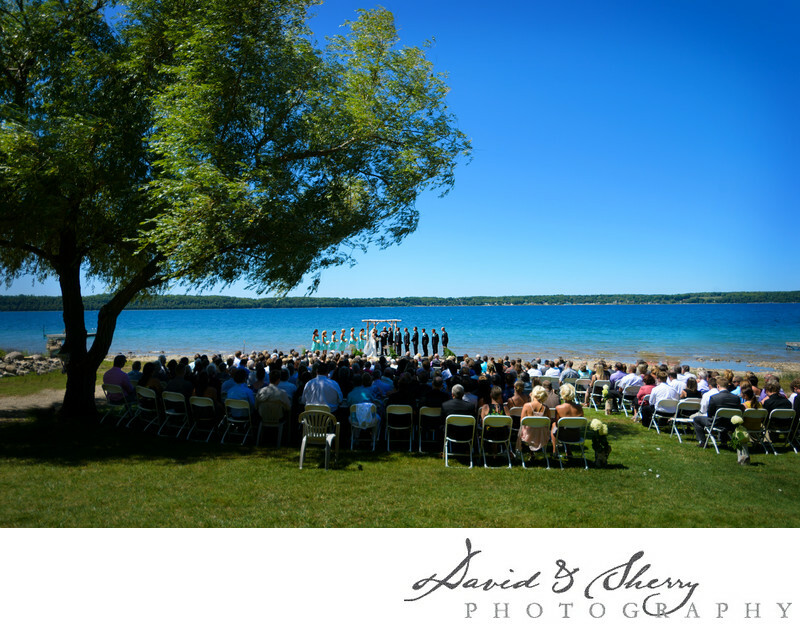 Surrounded by guests and loved ones, the bride and groom said “I do” with crystal clear water in the background. The sky was just as clear and there was not a cloud in sight. Although the air in Wiarton can be slightly cooler because it is on the water, the sun was shining bright which balanced out the cool breeze perfectly. This shot of the ceremony is a glimpse at the entirety of the scene. I love the way the bridesmaid's dresses go with the many shades of blue behind them, as well as the tree that leads the eye to the bridal party and the newlyweds.